Fangoria says, "Harper Voyager’s FEAST: HARVEST OF DREAMS, by Merrie Destefano, is a book you don’t want to finish. The story is fast-paced and the characters are likable, but more than anything else, the setting is a place you don’t wish to leave. Night Owl Reviews says, "Once again Merrie Destefano has put out an edgy urban romance that will attract both romance readers and fantasy ones. She’s developed creatures that have never been seen before and a world that seems only too possible." Fresh Fiction says, "Merrie Destefano clearly created an awesome character with Samwise. I loved the dog turned beast, but still portrayed as a protector for his family. I thought that this was the best part of the story. Samwise was a brilliant idea." Dear Author says, "While reading this book, I was reminded quite a bit of Neil Gaiman. Not just because of Maddie’s character, who writes comic books, novels, and screenplays and has a cult following that track her all the way to Ticonderoga Falls, but because of the way real world and fantasy dream worlds blend and overlap in the setting. Much like in a Neil Gaiman work, Maddie accepts the fantastical without fuss." Minding Spot says, "FEAST is a spectactular urban fantasy! 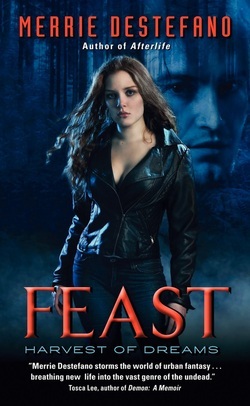 Original, spooky and inspired, FEAST will leave you with goosebumps and turning the pages for more. Maddie and Ash are wonderful characters and the addition of Samwise, the dog, and little Tucker really bring a sense of belonging to the reader."